These are lyrics by Adam Sandler that we think are kind of funny. 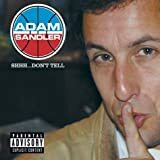 Adam Sandler's, "Ode To My Car"
This is the censored version, with the car horns covering up all the expletives. I actually think it's funnier than the uncensored version, due to the beeps!